There is no book quite like the Bible, and we believe that a printed Bible should be something special. The Filament Bible is a celebration of everything we love about printed books. It features a carefully crafted page design, offering you the best possible reading experience in a single-volume print Bible. We put great care into every single detail in order to create that kind of experience. It begins with a line-over-line, single-column typesetting. Bibles are commonly designed with two columns of text on every page in order to maximize page efficiency, fitting as many words as possible on each page. However, doing this also leads to smaller font sizes, shorter lines of text, and a somewhat uncomfortable reading experience. A single-column typesetting allows us to use a generous font size and optimize line-lengths for a pleasurable reading experience. In the Filament Bible, we have also provided a generous margin on the outside of each page that you can use for taking brief notes or just give your eyes some space to rest as you ponder the truths of God’s word. We also took great care in choosing the paper and binding options for Filament. The book block is printed and bound with care in the U.S.A., smyth-sewn, and finished with a fine LeatherLike or premium cloth hardcover with elegant copper foil stamping. All of those details come together to provide the kind of reading experience the Bible deserves. 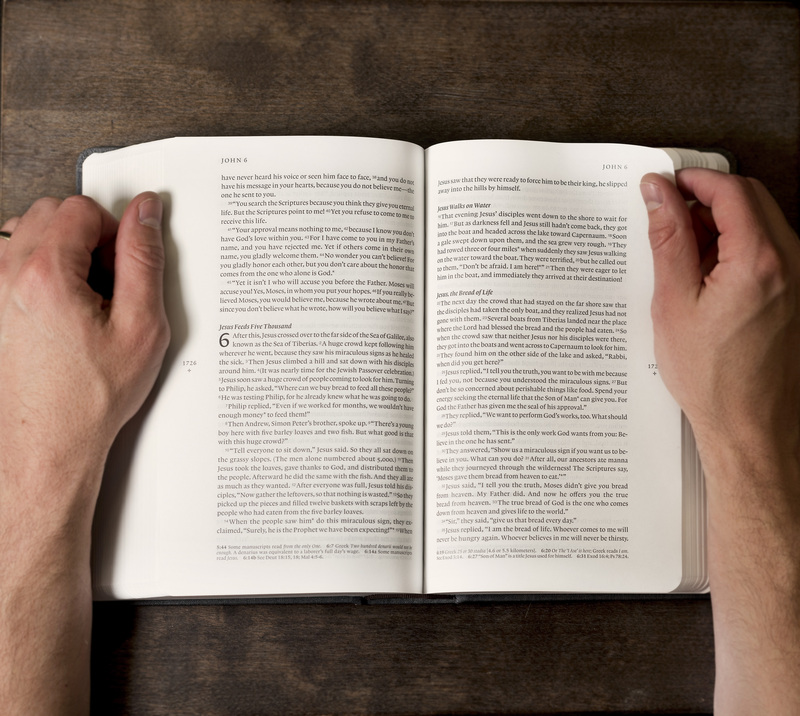 When you sit down with the Filament Bible, you can simply read the word of God with no distraction. Learn more about Filament, click here.